Mountain Biking up and over Garburn Pass - Local Articles - Mountain Bike Cumbria - beautiful trails and information from throughout the Lake District and beyond! 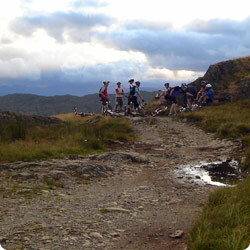 Garburn Pass is one of the well known climbs in the Kentmere area. It can be approached from either the Kentmere or Troutbeck side. Each side has it's own character, so if you went up one way it would feel fairly different from the other direction. Location map, please open in a new window. I am starting from the Troutbeck side as there are four alternative points from which you can start! This is the easier of the four routes, to get you to Applethwaite Quarry. Limited car parking is available at the entrance of Moor Howe. Taking this route after it has been raining means there will be many large puddles, all of which I will ride through, they are not deep, but can get very large! If you are one for not getting wet, all except for two or three can be ridden around. After all those puddles, you will come to Dubbs Reservoir which is where the trail really starts to get rocky. This section of the trail has a few small rocky climbs and is nice to ride along when you get near to the quarry. Nearing the quarry, you will be faced with a reverse Y type fork in the trail (this is the point where all the alternatives join together), carry straight on through the gate and you will soon reach the start of the rocky accent! Not much to add about this route, until you get to the cross roads, half way up. That is where it starts to get rocky. This climb from the cross roads to the gate is very rocky and even the best of riders might have a challenge getting around the corner near the top as it is very rough, but with some skill I am sure it can be cleaned. This is the hardest option of all four routes to climb. More rocky accent and when it is wet it gets very slippery, well worth the climb if you can do it. If you have already been for a ride, I would suggest you enter Garburn via route 1, 2 or 4 depending where you have come from unless it is dry it will be far more fun then! Once you have go to to the top of this climb and reached the cross roads, you will need to cross over on to the rocky climb. To get to this part of the trail you need to go in to Limefitt Caravan Park and carry straight on till the main buildings and the start of the bridleway. Once through the gate and your on the bridleway it goes up a short way, be careful that you take the right turn about 100ft up or you will be going up to High Street and that is another ride altogether! After you have taken the right turn, it is a steady climb to the cross roads, then you need to turn left, up the rocky climb. You can not see the quarry directly from the trail, but you can see the spoil heaps when your are passing it. The main entrance is ....... Caution is advised if you decide to explore and you enter at your own risk! Within the quarry the are several levels, some chutes (steep and dangerous) and lots of nice trees! More detail to be added soon. This track has been resurfaced in recent years, by that I mean they have made the boulders smaller, so the Mountain Rescue can get their vehicles up there if someone gets injured. If you are fit and have a nice light bike you should be able to make it to Garburn Nook without falling off, some dabs might be required but it is doable! I will be attempting it this year! Along the way there are a few rest areas and if you want to try your self at riding down a small steep grass decent (about 3 meters) then watch out for it about half way up. The track consists of boulder fields, rocky and a few smooth sections, all in all it is really a good challenge. After the first gate the track smoothes out to take you over the top of the Garburn Pass trail, there are a few small rocky bits, but if your like me you will fly over them or use them as mini drop-offs. This will take you to the 3rd gate and the top of the pass and then on to the downhill. This decent has plenty of rocky areas along the way down, ideal for the seasoned downhiller! As the trail winds it's way down into the Kentmere valley the track will smooth out into a S type downhill decent, sparse with rocks, until you reach a beck crossing (take care), then it gets rocky again, these rocks are smaller this time, but still as fun! There will be a few gates after this, before the second gate if you look to the right you will see the famous Badger Rock and if you have your bouldering shoes and mat with you, you can go for a climb. I am doubtful if you do! After the second gate follow the trail down and you will reach 'The Nook' a small series of houses near Kentmere. And if you want accommodation in this small village then there is Nook Cottage or Maggs Howe B & B And Camping Barn on the opposite side of Kentmere. All you need to do then is follow the road down and you are then in Kentmere. Since I just described the route from the Troutbeck side, here is a little more about it from the Kentmere side! As you know by now this section is rocky, but if you keep your wits you should be able to ride parts of it! It's far rocker than the other side and there are sandy sections, where unless your really lucky at getting traction then your going to have to walk this bit. There is also the long S climb, which is smooth and steep but I have done that before so am sure you can. This decent is by far one of the best around, what ever bike your on! I went down it on my Marin with 4 inches of air fork and still made it down faster than the guy on the full sus! If you are going to ride Garburn, best do it both ways or you miss out on the fun! It is rocky most of the way down, with some smooth sections and the occasional small drop. Enjoy! Taken from Old Roads of Eastern Lakeland by Alfred Wainwright. 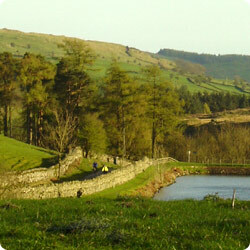 Until the mid 18th century, when a series of Turnpike Acts led to the construction of many new roads maintained by tolls, the Garburn Pass carried traffic over the hills between Troutbeck (with links joining from Ambleside to Windermere) and Kentmere, this being part of a cross-country highway of some importance leading on to Shap and beyond. 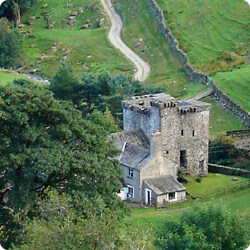 The 14th century Pele tower of Kentmere Hall witnessed the rise and decline of Garburn Pass as a commercial highway. Here in 1517, was born Bernard Gilpin, who had a distinguished career in Church, being know as "The Apostle of the North"
Badger Rock, also know as Brock Stone is one of the largest boulders in the Lake District of which many climbers use for bouldering practice. Wikipedia: Kentmere, River Kent, Staveley, Cumbrian Dialect. Limefitt Caravan Park is a 5 star Park spectacularly situated in one of Lakeland's most beautiful valleys, capturing the very essence of the Lake District National Park - a friendly place of peace and tranquillity set amidst truly breath taking scenery. Extract from the David Hall's web site, It has been suggested that parts may be of Norman or even Saxon times. It was re-roofed, probably in the mid-16th century, and the present ceiling beams are thought to be of that age. The building's site, in the middle of a circular walled burial ground next to a yew tree which is around 1000 years old, would suggest a very early place of worship. If you are lucky enough to live in the Lake District area (like me), you soon become picky about trails. What may appear to be an amazing mountain bike ride for those who live in the city soon becomes dull when it's ridden every day. This certainly does not apply to the Garburn Pass. When I bought my Marin mountain bike, this was the first trail I went on to test it out... and I crashed it straight away. Luckily, there was no damage done. Garburn is certainly not a bike ride for the faint-hearted or unfit. Whilst it is said "what goes up must go down", on Garburn, the opposite certainly does not apply - what might go down does not necessarily go up! In fact, I don't think I know anybody who has made it up all the climbing sections on the kentmere side of the ride. Some sections are so steep that traction is practically inexistant and with the big lumps of rock in parts, you can expect to be walking some bits. On the other hand, the descents on both side are fully rideable but at your own personal pace. The kentmere side is particularly steep with big bits of earth and rock missing in places, brilliant if you are on a full suspension or if you have lots of travel to spare - its also quite technical in sections. The troutbeck side is almost as good, particularly if you continue on down to Limefitt caravan park rather than Ings, plenty of potential for speed. 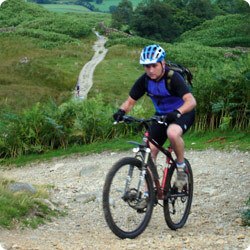 The other advantage that this ride has to offer is that it links in to lots of other mountain biking routes. For example, there are plenty of possible trails to continue on from Kentmere (Mickelmoss, Saddgill, Hall Lane) and likewise, you can continue over Jenkins Crag to Ambleside on the Troutbeck side of the pass should you wish. Was down at Windemere at the weekend, I did Troutbeck from the White Cross Bay area as previous mentioned by others, I was instucted to push my bike by locals at the rear of Low Wood Hotel area on the ascent. 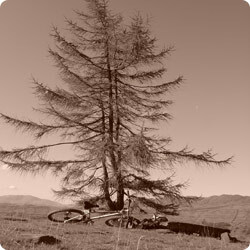 I therafter did the trail towards Troutbeck and returned finishing at Ambelside. Towards Ambleside it was very technical, considering I only had my basic Giant Rock. A very worth while route, most enjoyable and fast on the descent. I cycled from Staverly and over Garburn pass from Kentmear and back to Staverly, I found the pass un rideable at times I couldn't believe how rocky it was, the views were very nice though, I will not be rideing it again, It was a challenge but not enjoyable. Im looking to do The Nan Bield Pass route next although I've been told it very rocky again. 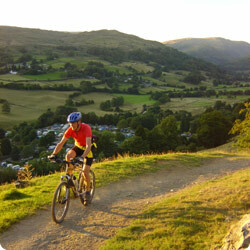 Garburn has been sanitised, the only way to ride it now is from the Troutbeck side into Kentmere. The ascent from Troutbeck is so smooth you are likely to meet pushchairs and prams on it - such a shame it was am amazing descent, one of the best in the Lakes. This trail has been viewed 77960 times!